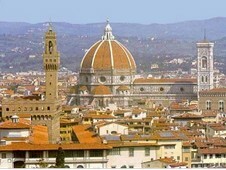 It is no exaggeration to say that Florence is the cradle of Italian culture. This comparatively small city has not only presented the world its lace, but also the Florentine coin, which has been an absolute European monetary standard for a long time. After all, here is the place, as surprising it may seem, where once were born or worked the absolute titans of art, such as Leonardo da Vinci, Dante, Michelangelo, and even Galileo. The number of attractions of this city strikes the imagination. After all, there are so many churches, basilicas and monuments here, many of which date back to the Renaissance times, to the Medici dynasty. A car hired in the airport of Florence will help you to discover more about this amazing cultural heritage belonging to one of the most beautiful cities in Italy. In order not to become frustrated because of a given penalty, you should comply with the speed mode regulations that work upon the territory of Italy and thus in Florence as well. Of course, it is important to remember that the Italian legislation allows a 5% margin of error in the driver’s favor while detecting the speed limit. Nevertheless, rules are the rules. On the trunk highway it is recommended to keep the speed of 130 km/h. after the breathalyzer reaches the 1,5‰ mark, you will meet major issues. First of all, there will be imposed a penalty from €1500 to €6000; secondly, a driver’s license deprivation for the time period from 1 to 2 years, and possibly this epic will be crowned with the imprisonment for the time period from six months to one year and car confiscation. In case of refusal from the health screening, there will be imposed practically the same measures, as in case of a blood alcohol content level exceeding the 1,5‰ mark. The phone talks should be performed only if the car is equipped with the communication devices, which allow to talk under the hands-free condition. In the small Italian towns, to which Florence does not belong, there is one pretty feature — when passing through them during the day, at lunch time, you can get into the «quiet hours» — some fuel filling stations simply do not work at this time. Near the major highways you can service your car for 24 hours a day by the 95 (€1,75) and 98 (€1,88) standard lead-free petrol, as well as by the diesel fuel (€1,64). If you need gas, this variant is also possible. I love to visit unfamiliar places with my wife. Not so long ago, we returned from Greece. We traveled on a rented car and the price for the week was quite low. We found the car, reserved it and paid for it via this car aggregator. Upon the arrival in Athens, we got the clean car with a full tank without any problems. We drove out and looked at a large number of attractions without haste. We liked to travel by car.